Coffee and has brown made out of kamansi seeds were also displayed by the Industrial Engineering Department. 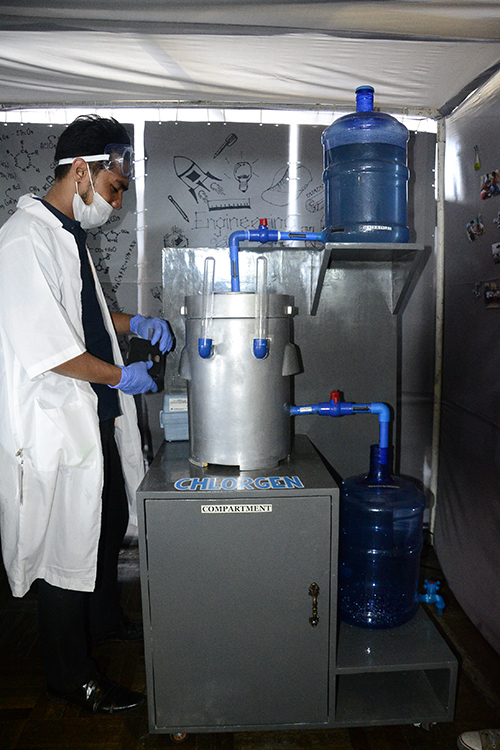 One of the exclusive researches showcased by the Mechanical Department is the Chlorgen or Chlorine Generator. It can generate chlorine solution out of salt water. 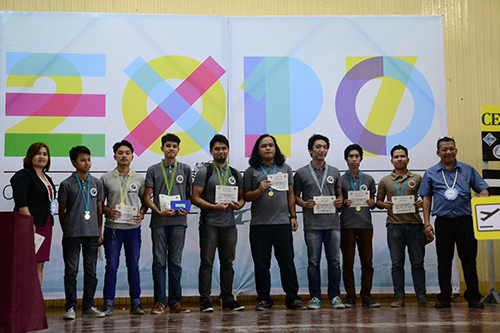 The students from the Mechanical Engineering Department who won first place in the best prototype category with Engr. Aylene Ingkoh (left most) and Engr. RJ Electron Tabacug (right most). The 2nd annual College of Engineering and Technology (CET) Expo 2017, held last February 13, 2017 at the Dr. Juanito Bruno Gymnasium, showcased another impressive and innovative display of undergraduate engineering talent. This year’s exposition featured 18 projects conceptualized, designed and built by students from across the departments of Mechanical Engineering; Industrial Engineering; Electronics and Communications Engineering; Computer Engineering and Computer Science; and Environmental Engineering. This year’s expo also introduced collaborative researches between the mechanical and industrial engineering departments. Present during the event were representatives from different stakeholders, namely: Engr. Ronel G. Castelo- Director, Mega Sardines Zamboanga Operations; Engr. Rolando G. Acuña- Provincial Director, Department of Trade and Industry (DTI) IX; Cris Angelo Prieto and Michelle Love Palita- Department of Science and Technology (DOST) IX; Engr. Carl Santiago Beldua- Zamboanga City Special Economic Zone and Freeport Authority; Engr. Carlos Ybañez- Engineering Supervisor, Commission on Higher Education (CHED) IX; Ms Cecille San Juan- Tourism Promotion and Development Service; Mr. Eugene S. Kanindot- Center for Information and Technology Services, Ateneo de Zamboanga University; Engr. Mary Ann Beth Kong- School of Engineering Information and Communications, Universidad de Zamboanga; and Engr. Archadie Badjin- DTI IX. They also served as evaluators of the products. CET Dean Dr. Roberto M. Sala stressed the importance of equipping our students the learning capability to produce quality research outputs as they are able to apply learning in the classrooms. In describing the learning process involved, Dr. Sala emphasized that “It’s really the students who fabricated these prototypes- from designing, building, calculating expenses, to analyzing its industrial viability”. This expo is not only a response to the University’s mission of producing quality researches but an opportunity for the college to be recognized and become an ideal source of investment. Dean Sala also mentioned that although they experienced some setbacks he is happy because they have been receiving positive feedbacks from stakeholders outside since last year’s expo. “Many are impressed with the quality of our graduates who have the technical knowhow,” said the Dean. “Fabricating different prototypes have allowed the students to have a competitive edge in terms of knowledge and skills,” the dean added. Dr. Sala is also hopeful that these researches and prototypes can be patented in the Intellectual Property Office of the Philippines (IPOPHL). The students are now working hand-in-hand with the University Innovation and Technology Support Office (ITSO) coordinator Ms Sarah Sapalo to have some of these inventions patented especially as we are gearing to become a research university. An invention though needs to undergo a thorough process before it can be patented and the process involves a significant amount of money. “The innovation must fulfill three basic requirements: (1) it must be novel; (2) it must involve an inventive step; and (3) it must be industrially applicable,” Ms Sapalo said describing the prerequisites before an invention can be patented. Once an invention is patented, the patent owner has the right to prohibit any unauthorized person or entity from using, making, or selling his product or process. One of the researches conducted by the Computer Engineering or CoE students is the Distance Reader for Tricycles which calculates the actual distance traveled by a tricycle. This is very useful for passengers and tricycle drivers because they can now calculate how much fare the former should pay based on what is stipulated in City Ordinance 185 without getting into arguments. The fare matrix for tricycle operations in Zamboanga City sets the regular fare at P20.00 for one or two passengers for the first kilometer, plus P5.00 for the third passenger with an additional of P5.00 for every succeeding kilometer regardless of the number of passengers. A research on “A Comparison on the Heating Value of Corn Cob and Corn Cob Briquette Using Cornstarch as Binder” was showcased by the Environmental Engineering (EnE) Department. The research studied the use of corn cobs, usually considered as waste products of corn harvesting, into briquettes with corn starch as binder. “This can be an alternative source of fuel for rural areas and low-income families because it is inexpensive especially that the corn cobs are widely available in the rural and agricultural areas”, Mary Ann Eusebio, a 5th year EnE student and the main researcher, said on the significance of the study. In the case of the Industrial Engineering (IE) department, the students collaborated with the ME department. The equipment or machines used in the manufacture of their products were fabricated by the ME students. 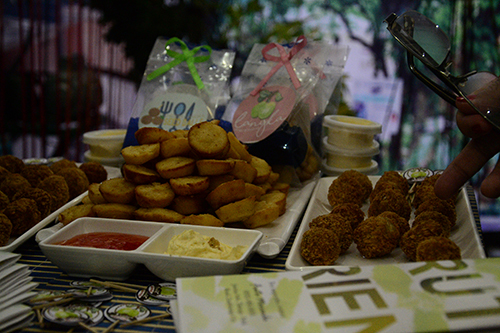 One of the studies showcased by the IE Department is the “Project Feasibility Study on the Production of Hash Brown and Kamansi Coffee” which also won second place under the food category during the 10th Business Idea and Development Award (BIDA) 2016 of the Philippine Chamber of Commerce and Industry. Different recognitions and awards were also given to the researchers. The collaborative researches were evaluated according to its potential (30%), researchers’ product knowledge (30%), project presentation (20%) and booth impact (20%) while exclusive or standalone researches were rated based on its usability (40%), prototype concept (30%) and the researchers’ product knowledge (30%).